Tokyo Asakusa’s Sanja Matsuri (Sanja Festival) is one of the best places to experience the excitement and energy of a mikoshi carrying parade. The festival is one of the three great Shinto festivals in Tokyo. 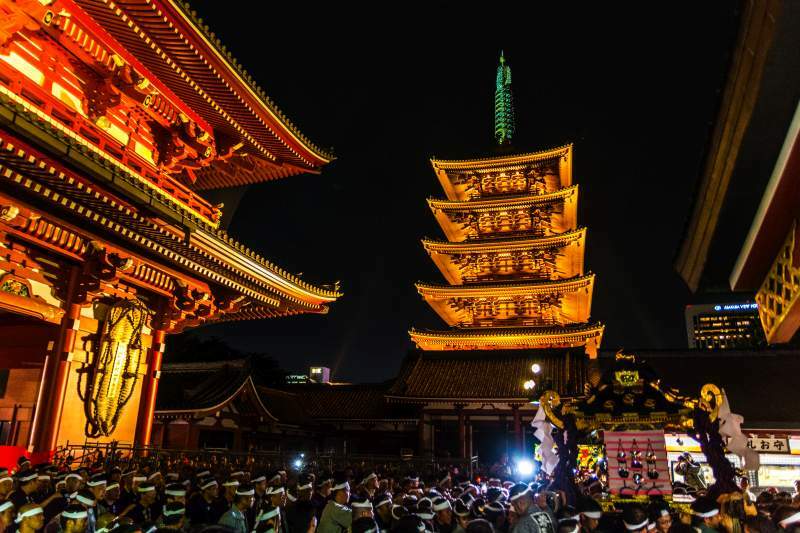 The festival is held in honor of the three men who established and founded Sensō-ji temple in Asakusa. 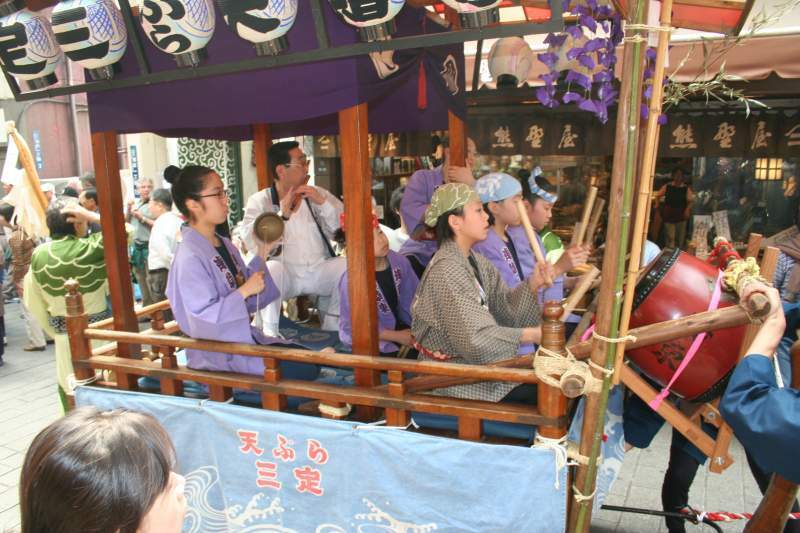 The Sanja Matsuri is held on the third weekend of every May at Asakusa Shrine. Over the course of three days, the festival attracts 1.5 to 2 million locals and tourists every year. The event is considered one of the wildest and largest festivals in Tokyo. Mikoshi being carried to steps of Asakusa’s Senso-ji during the Sanja festival. The festival starts on Friday with a large parade … a 19-block procession down Yanagi Street and Nakamise-dōri to Asakusa Shrine. Participants wearing traditional Japanese attire, including musicians, performers and dancers parade down the streets of Asakusa. 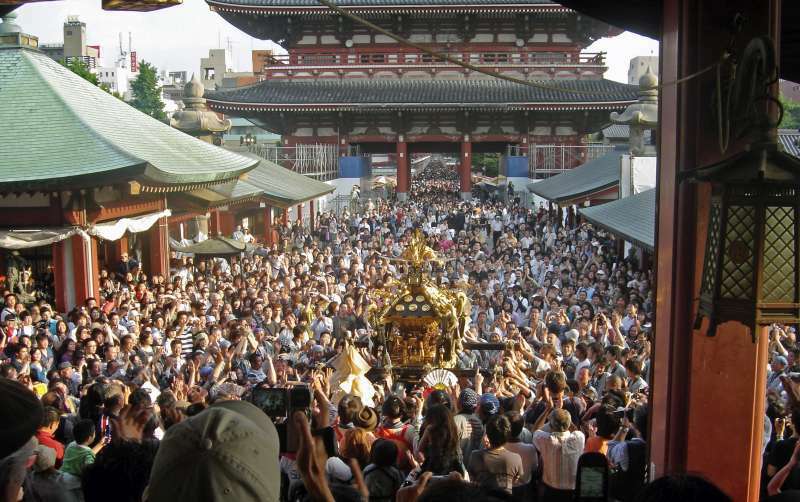 On the second day, Saturday, approximately 100 mikoshi from the 44 Asakusa districts gather and are then paraded through Nakamise-dōri and stop at the Hōzōmon where they pay their respects to Kannon, the Goddess of Mercy. The mikoshi are then carried to Asakusa Shrine where Shinto priests bless and purify them for the coming year. A mikoshi, a portable Shinto shrine, is believed to serve as the vehicle to transport a deity while moving between the main shrine and the temporary shrine during a festival or when moving to a new shrine. Often, the mikoshi resembles a miniature building. Sanja Matsuri’s most important event occurs on the third day, Sunday as a procession of the three Asakusa Shrine-owned mikoshi begin their march down Nakamise-dōri toward the Kaminarimon. These three shrines honor the three men responsible for the founding of Sensō-ji temple. The three mikoshi split up and visit and bestow blessings to all 44 districts of Asakusa. Then when evening falls, the three shrines find their way back to Asakusa Shrine. Night scene of Sanja Matsuri. 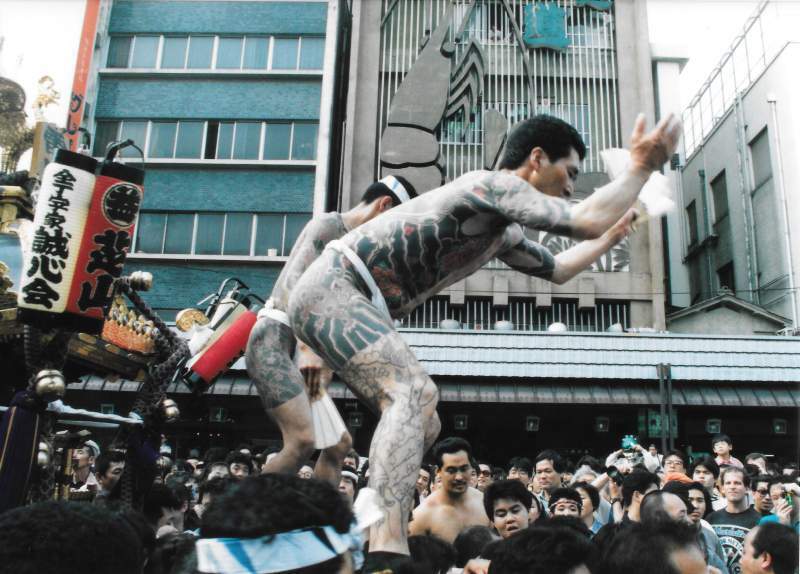 The Sanja Matsuri is also one of the few times in Japan you will see Yakuza openly display their tattoos in public. 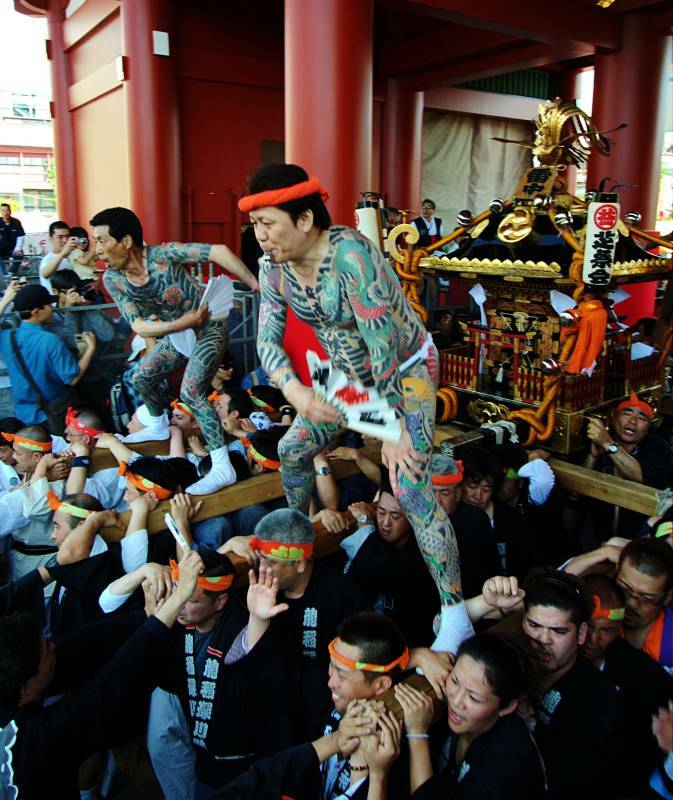 Several of the many mikoshi that participate from the 44 Asakusa districts are carried by Yakuza. Not to worry, they are at the event to have fun and with tattoos on display they are happy to pose for photos.